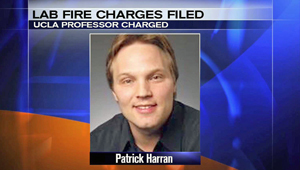 The LA Daily News carries a story about the hearing concerning the fatal lab fire in 2008 for which the local DA is holding Professor Patrick Harran criminally responsible. A possible four-year prison sentence is involved. As we have noted in past blog postings, the Regents were at one time charged along with Prof. Harran but have been dropped from the case. UCLA legal counsel believes that this matter is being overcharged by the DA for whatever reasons and is providing his defense. We have also noted that the DA has charged another UCLA professor in a totally-unrelated case, possibly hoping to pressure some kind of settlement in the Harran case.